Ophrys splendida grows to a height of 10 to 30 cm. The inflorescence develops 4 to 6 flowers. Their broad sepals and petals are spreaded. The broad labellum is undivided or vaguely trilobed. The sepals are rose, sometimes rather bright. The petals are lightly darker, with green edges. The dark-brown labellum has a pattern in the form of the letter H.
The species was described by Peter Gölz and Hans R. Reinhard in 1980. 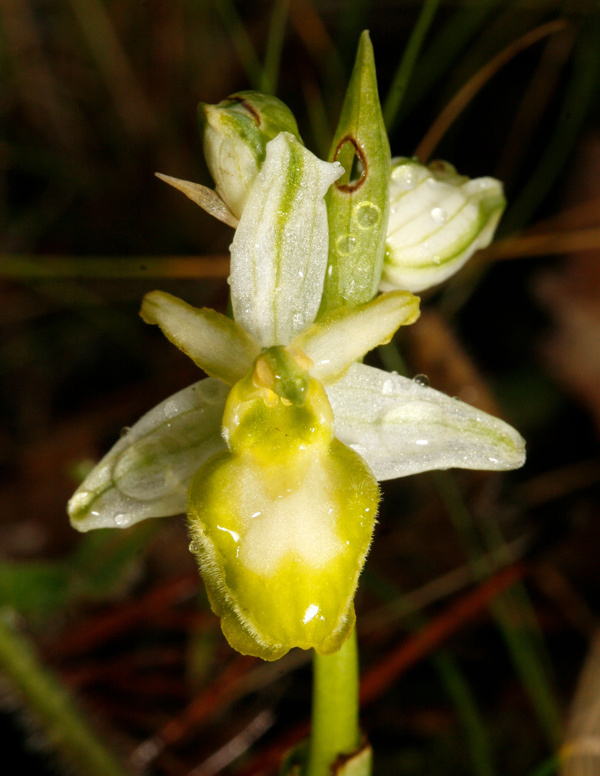 Before, it was viewed as a variety of Ophrys arachnitiformis. Another taxon is Ophrys exaltata subsp. splendida, described in 2002 by Remy Souche (Romieg Soca). In the case of reduced or missing colour pigments, the labellum is yellow-green, the pattern is still visible as a white structure. Sepals and petals are unchanged. Ophrys splendida grows on meadows in Southern France, up to heights of 600 m. Flowering is from April to May.